The open season for MDU Resources' natural gas "Dakota Pipeline" will end on May 30th, but the project may not have any legs. In a Reuters report, company officials indicated at a New Orleans energy conference in March that they are currently lacking enough binding commitments for the project. The company began it's open season on January 30th for the $650 - $700 million project, which is intended to transport natural gas through North Dakota to interconnection points in Northwestern Minnesota. 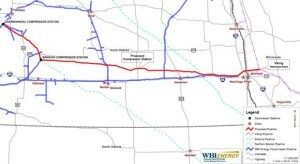 WBI Energy, a subsidiary of MDU Resources, revealed in a press release in January that construction on the proposed pipeline could begin in 2016, with a completion date of 2017. Despite the lack of current commitments, Goodin is encouraged about the pipeline, but admits in the Reuter's report that the challenge is for the marketplace to see that far in advance. The natural gas rig count in the Bakken has held flat at -0- for some time, and the price of natural gas since the beginning of 2014 has hovered between $4 - $6/mmbtu. The pipeline makes sense for the region from a flaring standpoint according to the North Dakota Industrial Commission (NDIC). Currently, ~30% of all natural gas produced in the state is flared, and without effective infrastructure in-place, no other economically viable choice exists for companies targeting the oil rich Bakken Shale.